During the lunch hour on Friday, May 18th, Socialist Action members gathered with about 200 like-minded people at an emergency rally outside of the office of Foreign Affairs Minister Chrystia Freeland. We were there to urge the Canadian government to condemn Israel’s May 14th massacre of at least 60 people and the injury of 2,700 more, including the shooting of Palestinian-Canadian Dr. Tarek Loubani. The protests follow the decision by US President, Donald Trump, to relocate the American embassy to Jerusalem. Trump’s move has been widely criticized by the international community. After a few speeches, including the reading of a letter to Prime Minister Trudeau, the group then marched from Freeland’s office to the Israeli consulate, where it staged a “die in” in the middle of the road. Throughout it all, we loudly chanted slogans including: “Hey Hey Trudeau – Occupation Has Got to Go!”; “Free Free Palestine – Zionism is a Crime”; “From Palestine to Mexico: Border Walls Have Got to Go”. The Gaza border protests are actually part of a larger struggle which began on March 30 when more than 30,000 people demanding their rights for justice and the right of refugees to return to their home land. At that time, 23 people were murdered by Israeli Defence Forces and more than 1400 people were wounded. In over six weeks of mass protests, at least 115 protesters were killed and more than 9000 were wounded. Since its founding 70 years ago, Israel has maintained a regime of of settler colonialism, apartheid and occupation over the Palestinian people. It is a racist regime which privileges Jews over non-Jews. On a daily basis, millions of Palestinians face indignities and institutionalized discrimination, including the denial of the the right for refugees to return to their homes from which they were violently removed. Since 1967, Israel has maintained an illegal military occupation over the West Bank, East Jerusalem, and Gaza. The situation in Gaza has been particularly brutal. Over the past decade, Israel has murdered and injured thousands of Palestinians. Palestinians are forced to live in the world’s largest open-air prison–something that in a sick sense of irony resembles the very concentration camps which many Jews and others were forced to live in as prisoners during World War 2. According to various reports from the United Nations, Gaza today has become unlivable. Residents of Gaza are without access to food, education, health care, electricity, and work. Ninety-seven percent of drinking water is unfit for human consumption. So much so that it is slowly poisoning millions of innocent people, mostly children. Electricity is only available for a few hours a day, and the unemployment rate is the highest in the world. Socialist Action Canada demands the Canadian government condemn Israel’s violations of international law, including its illegal occupation, building of illegal settlements, and imposition of a siege on Gaza. We also demand that the Canadian government denounce the opening of any embassies in Jerusalem, as this act is illegal under international law. Socialist Action calls on Canada to impose sanctions against Israel, similar to the sanctions that were imposed against apartheid South Africa. And we call for an immediate embargo on the sale of weapons to Israel. Stop the violence against Gaza and end the blockade! Free all Palestinian prisoners, including the more than 400 children! We demand the right of Palestinians refugees to return! End all military and economic aid to Israel! Support the Boycott, Divestment, and Sanctions (BDS) campaigns! What if the bombing of Gaza were taking place in Toronto. What would be hit? A new short film by John Greyson reimagines Israel’s massive bombardment of the Israeli-occupied and besieged Gaza Strip as if it were an attack on his home city Toronto. Watch. Lift the Siege of Gaza! Boycott Israeli Apartheid! Justice for Palestine! 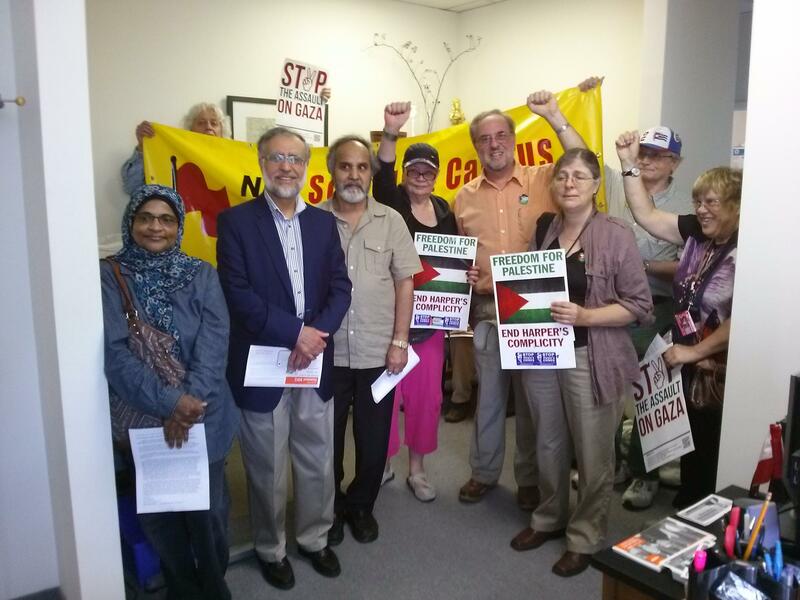 Members of the New Democratic Party Socialist Caucus, joined by anti-war, labour, human rights and community activists, are here today to say: We stand with the people of Gaza. We are on the side of Palestine in the present conflict. 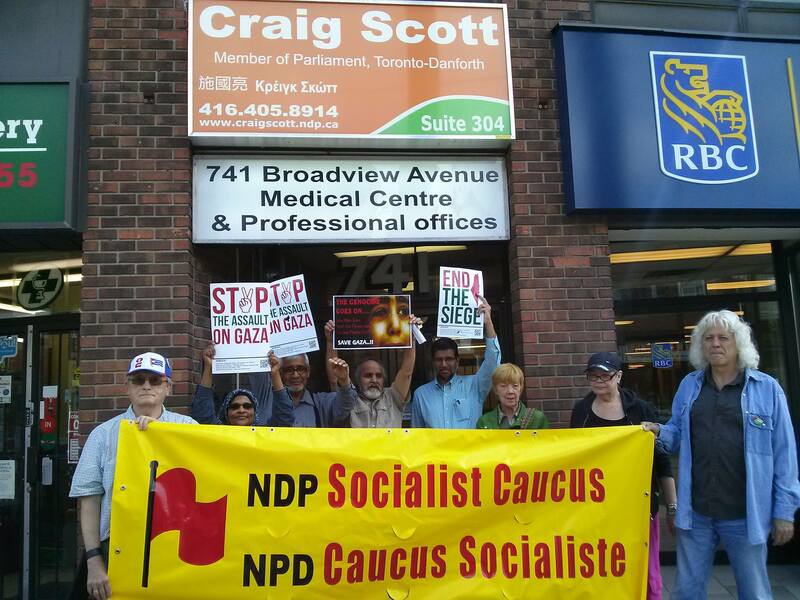 We call on NDP MP Craig Scott (Toronto Danforth) to stand up for justice, human rights, self-determination for Palestine, and the prosecution of Israeli war crimes. Statements by the NDP Leader, which MP Scott has echoed, fall far short of a ‘balanced’ or just approach to the war waged against the people of Gaza, in which the Israeli war machine has killed nearly 2,000, the vast majority of whom are civilians, including hundreds of children. This policy is wrong on many counts. The ‘two state’ solution is neither viable nor just. It would reduce Palestine to a few disconnected, impoverished Bantustans. The Oslo Accords failed even to slow, let alone halt the proliferation of Zionist settlements across the West Bank. Israeli jails are full of Palestinians never convicted of any crime. With the ‘separation’ wall, the Zionist state illegally seized Palestinian land and crippled the commerce of Arab cities and towns. Mulcair proposes lifting the blockade, but only after Gazans halt their justified armed resistance. He urges aid for reconstruction, and bringing injured Gazan children to Canada for treatment. The latter are fine sentiments, but grossly inadequate. Totally missing is a clear and unequivocal denunciation of the crimes committed by the dominant power. There is no moral equivalence between, on the one hand, brutal and devastating forms of collective punishment, using the most sophisticated weaponry, against an imprisoned people, and on the other hand, the firing of homemade ‘bottle rockets’ incapable of hitting a target. Mulcair’s stance blames victims and victimizers equally. This is an infernal ‘balance’. He says ‘end the occupation’, but robs it of any clear meaning. NDP members across the country, alongside millions of working people from coast to coast to coast, want the labour-based party and its parliamentary caucus, to advance NDP adopted policy. ‘End the Occupation’ must be more than a tag-on phrase. It must be linked to: Dismantle the settlements. Tear down the Wall. For the Right of Return of all refugees. End the shipment of arms to Israel. Free the political prisoners. Prosecute Israeli war criminals, starting with Benjamin Netanyahu. Boycott, Divestment and Sanctions against Apartheid Israel. Abrogate the special trade arrangements between Ottawa and Tel Aviv. For a single, secular, democratic state, based on full equality of rights for Jews, Muslims, Christians and non-believers, for Arabs and all others, in a unitary, free Palestine/Israel.